Snoop Irony: Schwarzenegger's state is making sure you have less muscle. "Behind every bad tragedy is a good conspiracy," we like to say here at the Snoop. (Well, not really, but when you talk about conspiracy it's always good to open with a touch of drama. The small-governmenter press thinks the chicken bird flue epidemic is a conspiracy front. Unless you're living under a rock you must know that the USA is going through a massive eggs shortage, including rationing and skyrocketing prices. Gym-goers, athletes, bodybuilders and the physique "elite" all have diets which hinge on protein sources, and thus may be paying particular attention to this shortage. Their struggle for excess protein intake (wow – that's such an entitled and privileged concept, no?) just hit a pretty precarious curve in the road. The almighty egg is a protein staple that will soon have to be rationed rather than revered. Yet while this shortage of eggs has been blamed mainly (and not wrongly) on a massive epidemic of bird flu, there are always other ways to see the big picture. There is no doubt the epidemic has caused a massive pressure on the egg industry, considering that all flocks where the disease is detected by law have to immediately and completely destroyed. We're talking, like, millions of birds at a time. And turkeys too. However, a few months back one clever (if slightly paranoid) writer at the New American took a different spin on the pricing side of the issue. While the mainstream media has us all focused on the flu, the New American noted how the price hikes are part of a larger and ongoing pressure on the chicken industry. In California early this year a law was passed stating that chickens now all need to be penned in cages that allow them to fully spread their wings and move around. Which seems, quite frankly, a relatively rational law to have in place, if a little counter-industrial. But what it also means is that massive corporate operations have to literally expand upwards of 300% in size. 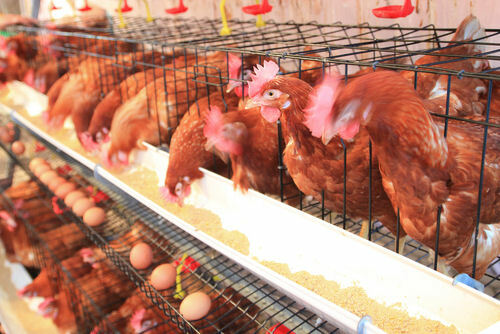 NOT COOL DUDE: Chicken farms by law have to upgrade their crappy caging conditions at massive expense the consumer. Comprehend that for a second. Major companies have to, by law, expand their operations three times in size. That is massively expensive. And who do you think picks up the bill? Now, the California law impacts not only California egg farms, but also those farms from which Californians buy from. Which means, by state law, the places (like Iowa and Missouri, among several others) that Cali gets their eggs have to also face the pressure of legally-mandated farm expansion. Add to these pressures a bird flue and you have, according to the New American, not only a price hike, but a massive scapegoat to hide the fact that these companies really just want to cover their costs for treating chickens humanely. It's a long article, but very worth reading for an eye-opening peep inside how our prices are inflating on foods through systematic process of government and industry pressure, rather than through random acts of nature. We guess you can't make an omelette without breaking a few shells.